Preheat oven to 350 degrees. 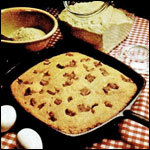 Prepare a 9 x 13 or 10 x 10 baking dish by spraying the inside generously with cooking spray. In a large bowl, sift together the flour, sugar, baking powder and salt. Add the vanilla to the milk and give it quick stir. Add the vanilla milk and melted butter to the dry ingredients. Stir until just combined and moistened. Transfer to prepared baking dish and smooth level with a spatula. In a small bowl, mix together the brown sugar and cinnamon. Sprinkle this mixture over the batter in the pan. Shake the pan gently to distribute the topping evenly. Scatter the small cubes of butter over the topping. Press each cube into the topping so they are barely visible. Bake for 35 to 40 minutes or until a toothpick inserted into the center comes out clean. 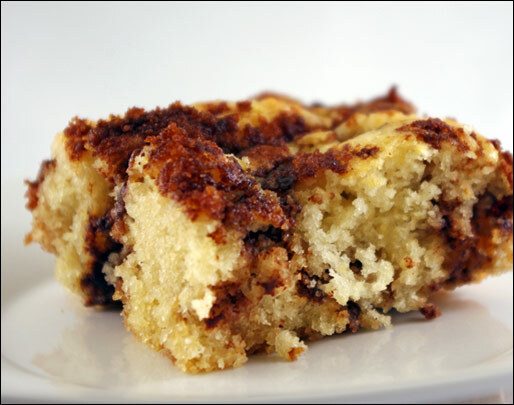 The beauty of the coffee cake are the little wells of extra flavor created by the random pockets of melting butter. Wait until the very last minute to cut your butter into small cubes. It'll be easier to work with. Instead of a baking dish, you could use two small loaf pans. 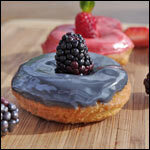 Mid-way through the baking time, you have a chance to manipulate your topping. If it seems to be accumulating in the middle or on one side, open the oven and - carefully - push some of the topping over to bare spaces using a knife or chopstick. In this coffee cake, cinnamon has a life of its own as it rides with brown sugar into bubbling bits of butter to make divots of gooey goodness. 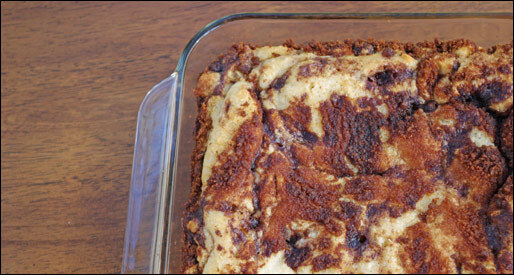 What do you think of Cinnamon Flop (Coffee Cake)? View all 25 comments for this recipe. I've made this a bunch over the years, never fails and is always great. I have made this several times in the last month or so. It is really easy and absolutely delicious as written! I have switched the recipe up slightly with the addition of blueberries, or chunks of peaches or chocolate chips! No it's not too sweet. And always make extra topping. I saw some one didn't like it because of the taste of the baking soda, hopefully they realized it was supposed to be baking powder. I was initially skeptical of the 2 tablespoons of baking powder, but it works. This is definitely a keeper. Cake surprisingly had risen a lot, this was probably due to the excess amount of baking soda. Overall it tasted okay and was pretty moist, but it tasted kind of weird. I would make this again, however with less baking soda and egg replacer. Turned out pretty good, I was half asleep when I made it so only used the recipe as a general guideline. I made half a recipe and put it in a smaller pan, used less sugar and half a thawed out banana, added some sugar free chocolate chips and some walnuts, and used a lot more cinnamon. I did use a full tablespoon of baking powder and I was all out of eggs. At 9 servings it is only 124 calories each. Not bad. This recipe is absolutely delicious! Followed the recipe and it came out perfect. Thank you! Are 2 Tablespoons of baking powder correct in this recipe? Seems like more than usual. Very moist, super easy to make and delicious! I would add some pecans or walnuts but otherwise my family and I loved it! Very easy to make and the whole family loved it, even my very picky grandson. I like to follow a recipe exactly as written the first time I make something new. As it is I don't see myself changing a thing. 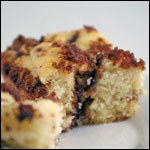 Moist, slightly crumbly (as a coffee cake should be) and flavorful! Just what I was looking for. I liked how the cake was very fluffy. Good flavor. This recipe was superb! I noticed that it didn't include an egg, so I added one in. The topping was the best part, full of flavor and sweetness. I don't have any complaints or suggestions whatsoever. Super happy with this one. Made this Fri. night to have Sat. morning. 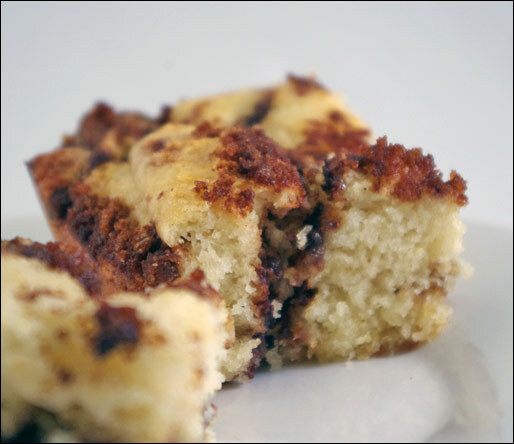 One of the better coffee cake recipes I've tried. Just had a piece today (Sun.) and it still tastes very fresh. I give it an A-. 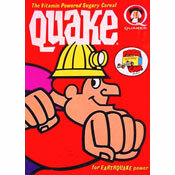 Everything is great about it, except the pieces are a little too crumbly. Wow! The whole family LOVED this recipe. I used two 8 inch round cake pans instead of the square pans called for. I doubled the topping recipe, grated apple into the cake (It gives it a bit of a unique flavor, plus it can now be called Apple Cinnamon Coffee Cake), added an egg (really solves the crumbly problem), and used a little less milk and more butter. Wow! My little brother says he loves the cake more than the homemade chocolate chip cookies I make (which means a lot!) I had fun baking the cake, and it turns out great! I did not make the recipe yet but I noticed most similar recipes uses 2 teaspoons of baking soda so I was wondering if this recipe had an error in saying 2 tablespoons of baking soda? 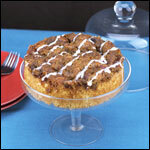 This coffee cake is AWESOME. Good cinnamon flavor. Buttery. A little crumbly. My family loves this cake! I added one egg so it's not so crumbly. Tastes like a cinnamon roll, yum! I'm 16 and I made this. This is like my first attempt at coffee cake. I had fun making it but not cleaning my mess. This tastes absolutely amazing. Took it to work and got some real nice complements. Thanks.